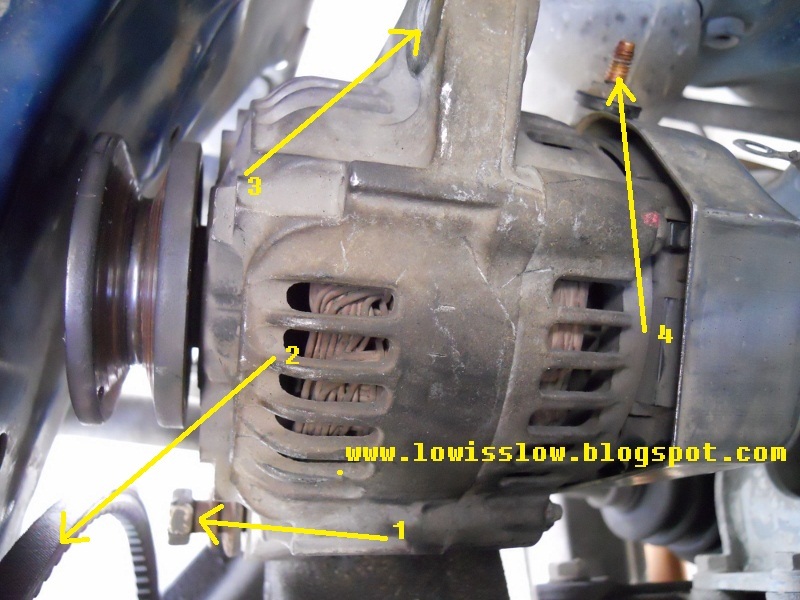 This is step-by-step on how to change the Perodua Kancil alternator carbon brush. Alternator plays an important role in the car electrical system, it generate electric to the whole electronic equipment as well as charging the battery. One of the most important part in the alternator in order to generate electric is carbon brush that will be exhausted in 7-8years depend on the usage. Before you start, disconnect the positive terminal on the battery to avoid short circut. Then disconnect all the wire connected to the alternator. One socket and another one that is covered by red cap (positive terminal) need to use ring no.10 to remove it. ﻿ To take out the alternator, there is three bolt need to unscrew. First, the tensioner bolt. After that you can remove the alternator belt. Second the tensioner itself that screwed to the engine block, both use ring/spannar no.12. The third bolt located at the bottom of the alternator, use no.14 ring/spannar. To take out the alternator from the engine bay, you need your personnal skills to do it. As for me, I take it out from below the black aircond hose, loosen any hose/pipe mounting before that to avoid over tension to the hose while the alternator through below it. 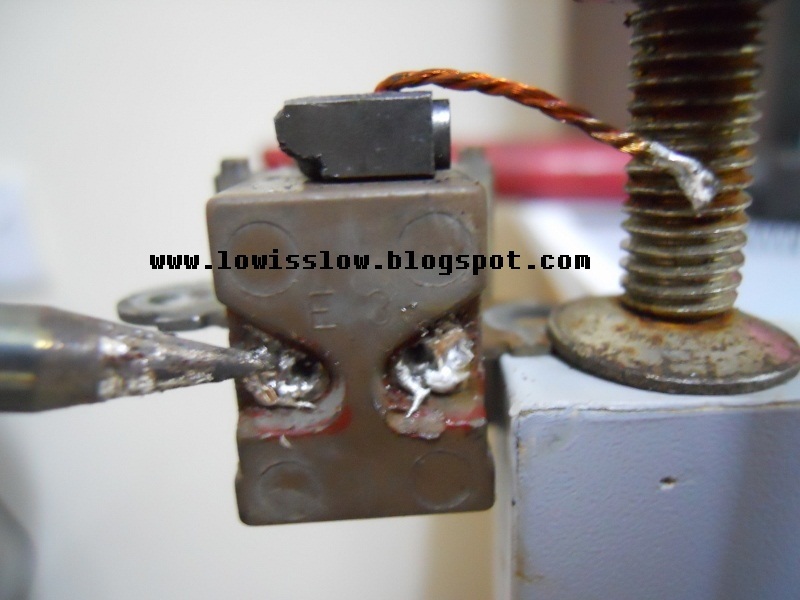 ﻿ Use screw driver to unscrew the three screw behind the alternator to remove the zinc cover. Refer picture above. If you have smaller size of spannar/ring better to use it. I'm not very sure what size it is, but very sure not no.8, maybe no.5/6/7. 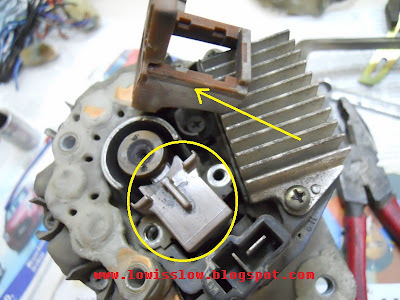 After remove the zinc cover, you will find the maroon rubber that cover alternator brush. Unscrew the two screw then you can take out the carbon brush. Refer picture below. Carbon housing with new carbon brush. Cut the remaining wire neatly after soldering done. ﻿ Then you can now put all the thing back into its place. When installing back the alternator to its position, screw bolt below the alternator first, second the tensioner mounting and last one the belt tensioner. Use wooden stick or iron rod to push the alternator to tension-up the belt while another hand tighten the tensioner bolt. Left: New carbon brush, Right: Exhausted carbon brush. RM3 only. Can buy it from auto sparepart shop. ﻿ Now, you can connect back all the wires and the battery terminal. The radio program preset and digital clock need to set back everytime the the battery terminal disconnected. Thats all for now.. Just do it and gud luck. I have done diy change the carbon brush on kenari..but during idling just got 12.50v only.should be more than 13>v right?. If ramp got 13>v..
Yup..should be more than 13v during idling.. I think you should change the alternator..maybe the electronic parts (Diode and etc. )inside the alternator malfunction already. Yup, the alternator at least got 13.8v for charging the battery. If your car running at 13.8v, it should be fine. Lower than 13.5v, the alternator is no good sign. Change your voltage regulator internally or sometimes, your alternator bearing might cause you problem. Got to bring it to professional technician to do it. my kancil alternator got smoke smells burn after i start the engine.after 5-10 seconds its became normal.the pomen said its cause the leakage of timing belt oil seal.if i repair the carbon brush will the smoke dissapear? You should change the oil seal. Replacing alternator carbon will not help the smoke/smells disappear. hello..i want to ask something.. 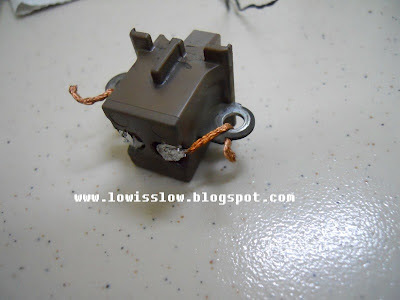 The output voltage of kancil alternator is Direct current (D.C) or Alternating current (A.C)?? Of course, the output voltage of any car alternator is Direct current. Only alternator internally produce A.C before filtering through rectifier which is called diode. Not very sure DC or AC. but i think it is DC. The whole car body/chassis is negative terminal. So the body/housing of the alternator itself is negative terminal. 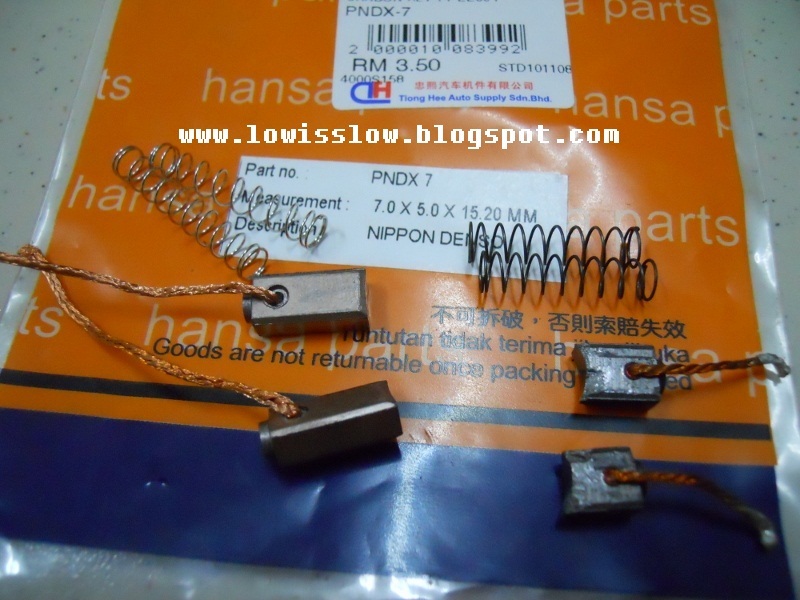 The function of carbon brush (plug in port as you mention) to supply the current to the wire coil in the alternator. It wasn't metal, but carbon brush. what about kelisa alternator.. can't i use the same step? ya, almost the same as kancil alternator. Only pulley is different. Okay..now lets say we have this problem....engine idling the volt reading is 14.2v...but when i turn up the headlight or Aircond...the reading drops to 12.1v...this maybe means not enough power left to charge the battery...sometimes my car barely starts the engine....but battery reading is at 12.7v during engine off....now the question is..is the alternator any problem? i mean if the car is idling...it should be enough power to support most of the cars accessories right? i only got 12.1v weather i rev it or not.....alternator kong liao ah? Bro..read comment from bro Anon 01:40 below.. He's right. I told you one bad news. Manufactory only give certain amphere for a small car just enough to run aircond, simple audio system, headlight and tail light. If you added any extra power accessories like subwoofer, high power audio system, 100w headlight, etc. Your alternator can't give enough power to them. At the end, it would be exhausted and burnt out the coil inside the alternator. So, in future, buy a big car. How about running the car, what is the voltage? If running the car, the voltage is about 3.8v or more, then it should be fine because it's still in charging state. It shouldn't be at below 13.5v . 13.6v or 13.7v still acceptable but better at least 13.8v . New cars are about 14 to 14.3v . If running the car, the voltage is 12.1v . I guess, your alternator probably near end of life. However, you need to take it out and let the specialist technician check. To confirm whether it is kong or just need to change the brush(carbon) inside the alternator. Belt loose or not? This might cause problem sometimes. Any noise from the alternator? If got noise, probably bearing out of order. But, you stated that 12.7v during the engine off. The battery look ok to me. How about the voltage reading in the next morning you wake up? If it were at 12.3 to 12.6v, the battery can be still considered in ok condition. Your last question, if the car is idling, it should be enough power to support most of the cars accessories? Sorry to tell you that Kancil, Kelisa or Kenari not able to produce enough power to supply to just basic devices. If you add other heavy powerful device, your alternator is going to say bye bye soon or later. If you don't believe me, try day time and night time. See the voltage reading when you stop at traffic light. Daytime, you just switch on the air cond and basic audio system. The voltage reading is just perfect about 14v to 14.2v . If night time, switch on aircond, basic audio system, headlight and tail light, car running, the voltage is just about 13.7 or 13.8v. Idling at traffic light, the voltage is 12.1v or could be less. If added powerful devices, imaging how low the voltage could be? Someone suggested me to turn off the headlight when waiting at traffic light. haha.. Both headlight 55w drain about 10 amp. Man, quite a lot. That's why now manufactory came out LED tail light and HID light. Save a lot of power. Manufactory cut cost to produce high amp alternator. They're smart marketing. Wow.. Its a brilliant information you shared with us here bro.. Thank you very much. really appreciate it. Agree with you bro..even install voltage stabilizer with grounding wire cannot help much..
No problem Jiken Bill. 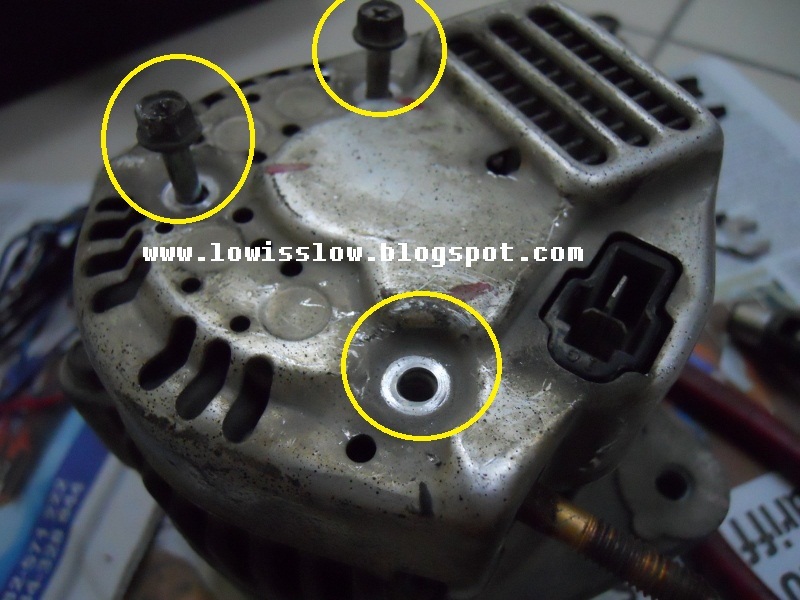 I had been suffered with my kelisa alternator problem long time. I kept surfing and studying the alternator about 1 and half year because I let machanic change the alternators more than 3 times within 2 years. Going broke and tired spending those money. So, finally found the answer myself. Ya, adding those voltage stabilizer give more burden to alternator. No use. But, adding ground cable might help a lot for old car which more than 10 years. New car ground cable just waste money and time. By the way, Jiken Bill. You did a great job showing how to dismantle the alternator and change the brush. Very appreciate it. You're the man. Where did you buy the carbon brush bro? Wsalam sama kes gan keta saya..just tukar alternator..lpastu bawak jalan bagi cas balik bateri lama tu..pastu keta ok..
carbon brush nak beli kat mana? kelisa 1.0cc altenator carbon brush jual kat mana? saya di usj. Hi ive just bought 1 kancil.. i can notive the engine starts easily but... the voltage coming from alternator goes down and down within a few mins only.. Advice pliz.And What alternator match same pliz? ?